Lourdes Youth Band - Welcomes their newest recruits. The Lourdes Youth Band (LYB) are delighted to welcome three new recruits to their ranks. Alex, Daisy and Tomas are no strangers to the Lourdes Band and have all been at the business end of our recent Solo/Ensemble competitions, they also assisted LYB in the towns St. Patricks Day celebrations. They will now take their places as full members of LYB and further their musical ambitions under the musical directorship of Mr John Walsh. LYB are very much looking forward to having the new members on board and will be delighted to gain from their musical addition to the Band. Congratulations to all three of you from all members of the Lourdes Brass Band - LYB - The beginner classes - Band Committee and every one in the organisation. Lourdes Youth Band - Deceased Members Mass. The Lourdes Youth Band paid their respect to the deceased members and friends of the Lourdes Brass Band. They provided a musical tribute at the 12.00 Mass in the Augustinians Church. Mr John Walsh, the Youth Band Musical director led the Band through their performances. The Bands thoughts and prayers are with our deceased members. Lourdes Youth Bands - Miracle performance. The Lourdes Brass Bands young achievers (The Lourdes Youth Band) have produced a miracle performance in the South of Ireland Band Competitions, held in the Cork town of Clonakilty. The band moved into the intermediate section of the competition following their recent win in the Junior section. With Mr. Harry Kelly (Lourdes Band President) taking the baton the young musicians have again brought pride to our organisation and to our Drogheda community. Harry Kelly takes the LYB Baton for Clonakilty. The Lourdes Band are very privileged to have Mr. Harry Kelly stand in for our resident Lourdes Youth Band Musical Director Mr. John Walsh. Unfortunately John’s work load as a professional musician will mean he is unavailable to take LYB to the Clonakilty, South of Ireland 2018 championships this July. Mr Harry Kelly, President of the Lourdes Brass Band will take up the baton and lead the young musicians to the Southern Championships. Harry is no stranger to either the Lourdes Band or indeed to the Clonakilty festival. Having won the competition multiple times with the Lourdes Senior Band. Harry and John Walsh have worked together previously, with John receiving lessons from Harry in his early days. The Lourdes Band has a long standing working relationship and close friendship with Harry for over 30 years now, in fact by taking the Youth Band, Harry is now conducting the second generation of band member’s families and even the third generation with the Smith family. As ever we are very grateful to have such an outstanding musician and musical director as Harry Kelly, to be willing to go right back to the basics with our youngest musicians. I know you will all join John Walsh the Band Committee and all our members wishing both Harry and the Lourdes Youth Band every success in the "South of Ireland" Clonakilty Championships. The years of service given to this organisation so generously by Harry over the years, is a large part of the success story that is the Lourdes Brass Band. Harry Kelly (Lourdes Band President) - Taking the Lourdes Youth Band to the "South of Ireland Championships" in Clonakilty. 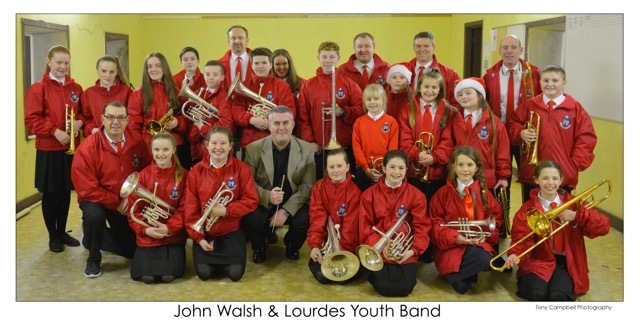 John Walsh has taken the helm at Lourdes Youth Brass as their new conductor. 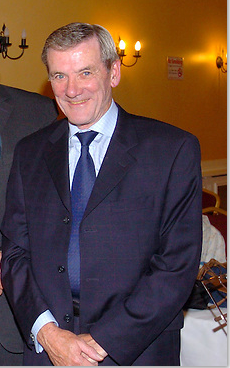 John, a hugely accomplished musician, began his musical studies as a member of the Artane Boy’s Band and subsequently studied Trumpet with Mr. Josef Csibi at the College of Music, Dublin. Under Mr. Graham Hastings (Principal Trumpet – National Symphony Orchestra of Ireland), he completed an Honour’s degree in music performance (Trinity College Dublin). Further study was taken with Mr. David Mason (Royal College of Music – London), Mr. Raymond Mase (Chair of Brass at Julliard School for Performing Arts, New York), and at masterclasses with Mr. John Wallace. In June 2007, he completed a Masters degree in Performance and Musicology, at NUI Maynooth.John has performed many solo recitals and regularly with The R.T.E. Concert Orchestra, The National Symphony Orchestra, The Orchestra of St. Cecilia, The Orlando Chamber Orchestra, and The Irish Baroque Orchestra. In July Lourdes Youth Brass, our youth band, entered their first ever competition, and with their conductor Mr Mark Shortt were crowned the South of Ireland Champions by scooping 1st place in the Junior of the S.o.I Band Championships held in Clonakilty. The adjudicator at the event was Captain Brain Prendergast, of the Army Band. LYB put in a lot of preparation and worked hard to get to their first competition performance, where the faced tough competition from seven competing bands. They opened their program with the march “Slaidburn” by William Rimmer, followed by Andrew Lloyd Webber’s “Pie Jesu” by featuring soloists Lucy O’Malley and Adele Maguire. To complete their programme they set the hall wild with the jungle sounds of “African Funk” featuring soloist Tara Shortt, with a backing feature of bongos and a whole manner of percussion. Capt. Brain Prendergast awarded LBB2 first place in the Junior Section and highly commended their performance and that of their soloists. This was a significant achievement for all involved and a huge accomplishment for their conductor Mark Shortt who led them to success.